In his newly released memoir on his experiences as a government official and international public servant, former U.S. Secretary of the Treasury, Timothy F. Geithner, provides an insightful jewel to both students and practitioners of public administration. His book, titled “Stress Test,” takes his audience behind the scenes within vast and complex, national and international public organizations. Though perhaps not necessarily known as a banker or as an economic academic, Geithner has extensive experience in central economic planning and in managing various regional, national and international financial meltdowns. This article examines Geithner’s time as a government official with the hopes of providing public administrators with food for thought, as they grapple with managing their government assignments along with bureaucratic politics. Under Secretary of the Treasury for International Affairs. Director of the Policy Development and Review Department at the International Monetary Fund (IMF). President of the Federal Reserve Board of New York. I highlight these roles because they exemplify some of the acrobatic feats that public administrators perform in order to be effective in their roles and as they strive to deliver quality service to those whom they serve. In his capacity as the Under Secretary of the Treasury for International Affairs, Geithner was responsible for providing the Secretary of the Treasury with sound council and advice on international economic issues. He was also responsible for developing and implementing international economic policies with other nations, as well as with international and multilateral institutions such as the World Bank and the IMF. To provide a better glimpse of the complex nature of this position, past items in this position’s portfolio included an incident where Haitian protestors turned back America ships, negotiations over Japan’s trade barriers in financial services, and global negotiations over debt relief. 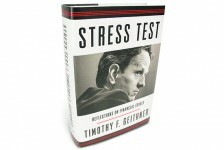 To produce successful outcomes, Geithner found it important to manage crises as they presented themselves. However, he also experienced utility in seeking-out and addressing potential areas of financial and economic hazard before they could metastasize into something more problematic. Geithner also found it useful to make a continuous effort in manufacturing the type of negotiating environment that would prove most productive in conducting high-level diplomacy on behalf of his office and the interests of the United States. As head of the policy development and review department at the IMF, Geithner experienced quite a shock in organizational culture and tempo. As an Under Secretary, he enjoyed the fast-paced business day. However, life at the IMF was different from his former office on Pennsylvania Avenue. Unlike most U.S. federal agencies, which have a single executive head, the IMF is a multilateral institution whose powers derive from the voluntary association of its member states. The IMF, composed of nine functional departments, employs about 2,400 individuals. Though the IMF has a single managing director, the executive board makes most of the decisions. Its style of steady deliberation and internal culture of consensus building is a stark contrast to the more crosscutting and streamlining approach of the American model. Crafting a set of principles to provide guidance during financial crises. Designing a set of limits for IMF assistance. Assisting in delivering bailout packages to Brazil, Uruguay and Turkey. Working with a multilateral institution such as the IMF is useful because it familiarizes one with worldwide trends and developments and provides a broader perspective on how policies can have far-reaching consequences. Though being a public economic policymaker on behalf of the American people is a bit different from working on behalf of the international community, the emphasis on improving lives and strengthening the broader economy share certain similarities. Whatever rhythm, prestige or excitement Geithner lacked as a bureaucrat with the IMF, he was able find with his next position as president of the Federal Reserve Bank of New York. Geithner states that of the Federal Reserve’s 12 regional banks, the New York Fed is the most powerful and influential. In collaboration with the private sector, the Federal Reserve System and other public institutions, the New York Fed plays a significant role in maintaining the health of our nation’s economic and financial system. The New York Fed shares responsibility with supervising some of America’s biggest banks including Citigroup, JPMorgan Chase and Bank of New York Mellon. It is perhaps this experience with managing the various inter-governmental, and other intricate and cross-sectional, public/private, legal and political, and economic networks, especially during crises, which ultimately gave then president-elect Obama, the confidence to raise Geithner to the position. As president of the New York Fed, Geithner was responsible for more than simply regulating and managing banks and other financial institutions. Geithner also served as vice chair and a permanent member of the Federal Open Market Committee. In this role, he played a key role in establishing, monitoring and implementing sound monetary policy for the entire nation. From his vantage point as the financial overseer of the jurisdiction containing Wall Street, Geithner was in a unique position to promote and provide policymakers in Washington, D.C. with a more contextualized understanding of economic policy that would essentially affect state and local, federal and even the nonprofit sectors of the national economy. The U.S. Senate confirmed Geithner in January 2009 to serve as the nation’s 75th Secretary of the Treasury. Far from his much earlier positions, which managed perhaps a handful of personnel and covered only certain geographical sectors or policy areas, Geithner inherited the responsibility of over 100,000 employees both here and abroad, as well as the entire worldwide portfolio of America’s economic interests and responsibilities. He became the economic face of the American government, and the most senior government representative on economic matters to members of Congress, the president and the public at-large. In his book, Geithner focuses primarily on his experiences in dealing with a falling U.S. economy and contending with the forces that caused the crisis. Of course, discussion of this topic led the author toward widely known episodes such as the bank bailouts and the systemic risk controversies, where some banks were classified as “too big to fail.” His narrative on resurrecting economic order also provides readers with an in-depth look into his role as the U.S. representative to the international finance ministers group known as the Group of 7 (G-7). The G-7 consists of the world’s seven wealthiest and most developed countries. During Geithner’s time in office, many European countries were facing major economic problems. The financial crisis in the U.S. continued to heat-up and it became incumbent upon Geithner to coordinate monetary and financial policy with his G-7 counterparts due to their deeply interconnected economic ties with the U.S. This book was a great read. In comparison to other memoirs from economic policymakers, such as Alan Greenspan’s “The Age of Turbulence,” this book did not require any specialized knowledge to get through it. For those presently within or interested in joining government service, this book is a great starting place to better understand bureaucratic life in American politics.